yWriter is a powerful novel-writing program which is free to download and use. It's designed for Windows 7 and later. yWriter6 is free to download and use, but you're encouraged to register your copy if you find it useful. yWriter Beta now includes Epub and Mobi export. 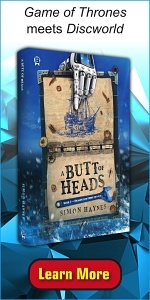 I'm Simon Haynes, the designer and programmer. Because I'm an experienced programmer AND a published author, yWriter contains a bunch of tools a working novelist will find useful, but you won't find any features some marketing expert dreamed up just because it sounded cool. What's so special about yWriter? As a programmer I'm used to dealing with projects broken into source files and modules, and I never lose track of my code. I decided to apply the same working method to my novels ... and yWriter was the result. Your work is broken down into chapters and scenes, and you can drag and drop them around to reorganise your novel. yWriter will export selected chapters to RTF format. Proof them, check the grammar, then import them back again! I realise Word, OpenOffice and other modern word processors have outlining features, but they don't have snapshot backups to sequential files like yWriter does. Roll back scenes to where they were half an hour ago, or re-read a version from four months ago - yWriter stores them all, automatically. "... much better than the stuff huge corporations make." - C.
A scene is a pleasant chunk to work on - small and well-defined, you can slot them into your novel, dragging and dropping them from one chapter to another as you interleave strands from different viewpoint characters and work out the overall flow of your book. You can also mark a scene as 'unused' if you've written yourself into a dead end, which will keep it out of the word count and exports without deleting the content. yWriter will export your work to LaTeX, a powerful page-description language. Use TeXworks (free) to generate a print-ready PDF! yWriter may look simple, but as the author of several novels written with this tool I can guarantee it has everything needed to get a first draft together. Without yWriter, I would never have become a published author. Best of all, yWriter is free. You won't pay anything to download yWriter, and the software contains no adverts, unwanted web toolbars, desktop search programs or other cruft. You can register your copy if you wish, but this is optional. You'll find the yWriter facebook page here. Users of earlier versions: You can install later versions (e.g. yWriter 4 and 5) at the same time as versions 2 and/or 3, and each version of yWriter has an importer which will read in any earlier yWriter project, right back to yWriter 2. The only thing you can't do is re-export your project back into older versions. Every major version of yWriter uses different installation folders and start menu entries, and they won't interfere with each other. Are you upgrading from yWriter5? Yw5 projects load and save from ywriter6 just fine. No importing, no converting. However, if you double-click a YW5 file it may still open in ywriter5. Just be sure to tick 'associate .yw5 files' when installing yWriter6. Spacejock Software and Hal Spacejock websites © 1999-2018 Simon Haynes, all rights reserved. Last modified November 6, 2018. Hosted by iiNet.